You know? I always find it hard to review good books. The books that pull at you, elicit the biggest emotions, the books that leave you in the happiest place – bookworm heaven. THOSE kind of books are the absolute hardest to review. It’s no secret that I am a huge Hart fan. It’s no secret that with each book Hart releases my love for her gets stronger. Know why? Because Hart has a distinctive way of telling stories. Hart tells stories that are full of emotion and realism, character and connection. Hart pours herself into her words resulting in those words then pouring into me and it’s the best feeling, honestly every time I pick up a Hart book, I know I’m going to get a full reading experience. Do I ever worry that her next book won’t compare to the last? No, I don’t. Because each and every Hart book is different, each and every character is different, each and every storyline is fresh and cannot be compared, shouldn’t be compared. I trust Staci and her writing, I trust that she’ll make it an experience I won’t forget and that’s why she’s one of my favourite authors and will continue to be while she puts pen to paper, or fingers to keys. 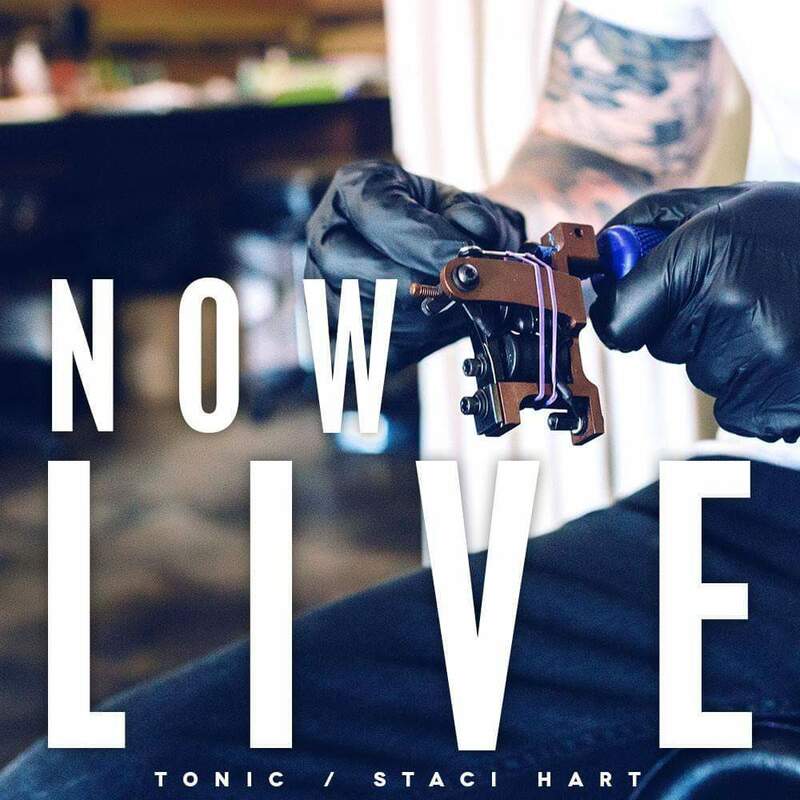 Harts latest masterpiece is Tonic. Joel and Annika’s story, and oh my wow, what a story it is. From beginning to end I have lived and breathed these characters wanting them in my head, my heart and fixed permanently under my skin. And they are, and they’ll stay, deeply inscribed forever like the most perfectly beautiful tattoo. At just 16% I got the tingles. You know the ones. Those feelings that set up your soul, those feelings that sizzle right beneath your skin, setting off goosebumps and butterflies. Those feelings of utter bliss and love over what you’re reading. Those tingles! I got them and I felt them strongly. What developed after that can only be described as pure bookworm pleasure. Joel and Annika’s relationship is fire and ice. Hot and cold. A delicious push and pull. It’s strength and love, weakness and hate all rolled into a perfectly pristine package of angst and brilliance. At 36% everything exploded. That delicious angst detonated into searing heat and left me breathless. Joel is one wicked, dirty, hairy b**tard. He’s utter sin, wrapped in perfection. Everything about him set me alight, from the raw visceral animal side of him to the deep swoony side that stole EVERYTHING from me. Annika, the ice to Joel’s fire. So hard and cold and strong but so utterly real and believable. I loved her, her persistence, her sassiness, her boldness that set her apart from any other. The polar opposite to Joel but more perfect than anything I could have imagined. 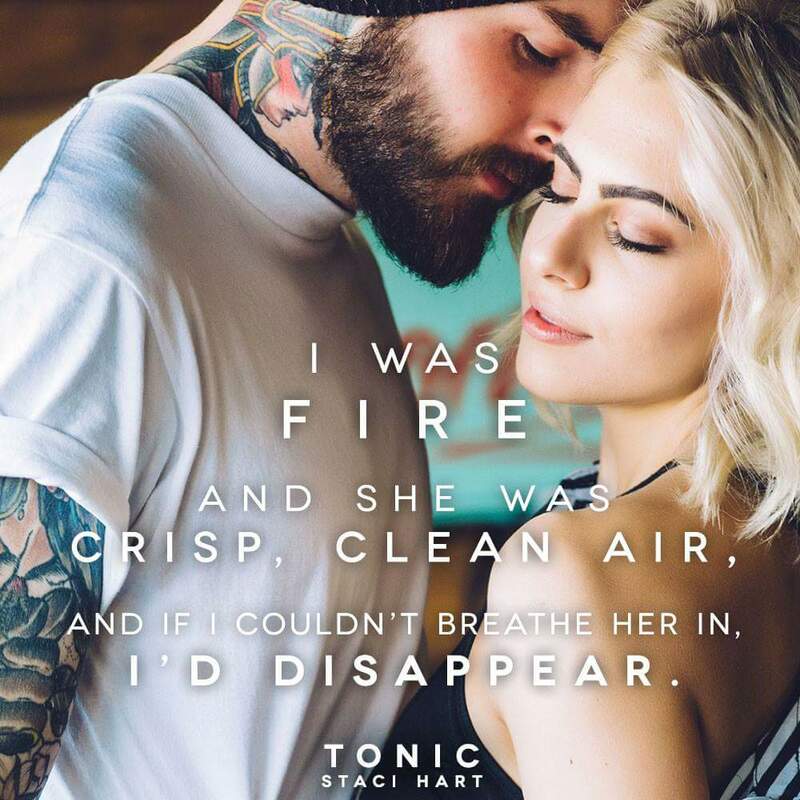 If you’ve read a Hart novel before you know that Staci has a way of wrapping you up in the softest blanket while her words break you down and embed themselves deep in your heart and her characters become your friends, people you love, but all the while you know that something will come and blow it all apart taking you down with it. In Tonic, the boom of the bomb she drops is really painful. It’s loud and rips the blanket and your heart to smithereens. And it left me a mess. A total blubbering mess filled with my own anger and desperation. But through the cold, the heat always wins and Staci, piece by piece, put my heart back together, slowly but surely, she made me smile through tears. She made my heart sing through raw devastation and she set my soul ablaze though love. 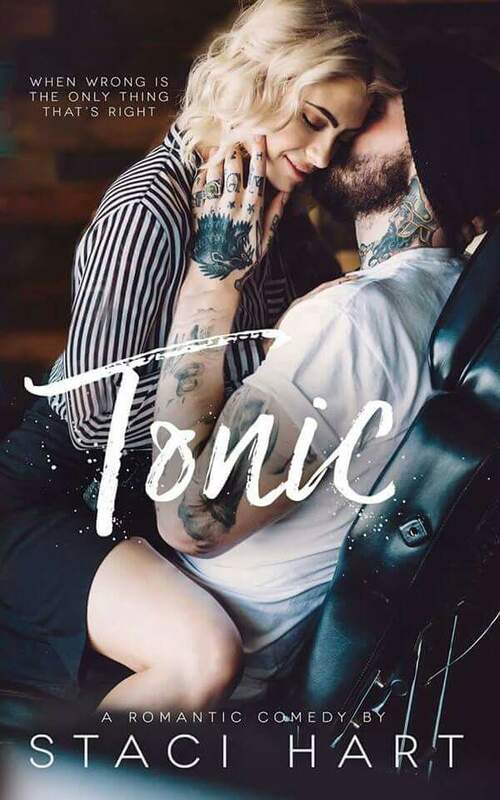 At 92% I never wanted Tonic to end. I never wanted to leave the world of Joel and Annika. I don’t really think I ever will. I’m sure they will remain deep in me alongside all of Hart’s previous characters. 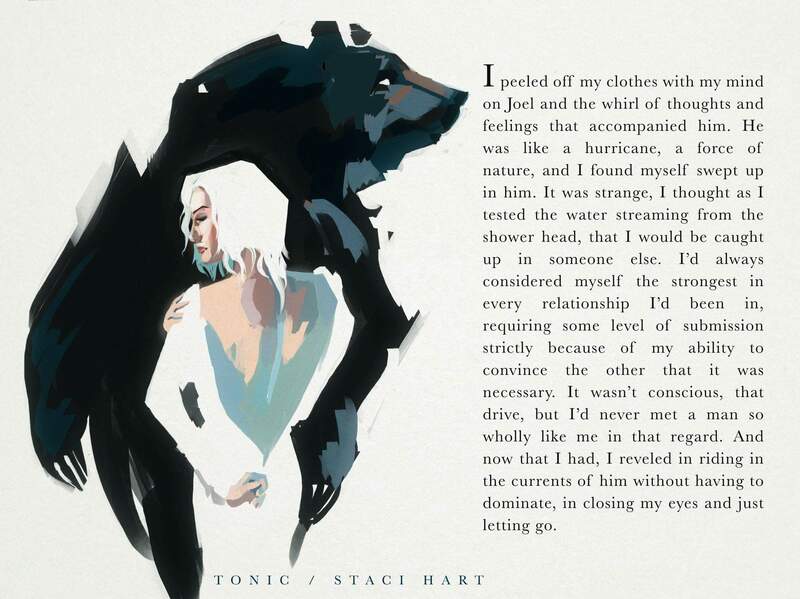 Tonic left me breathless, it made my heart ache and burn yet sing with the raw, realness of its words. It was everything I wanted and more. It was fire and ice, hot and cold..practically perfect in every way.